History: Bellevue Elementary School is Bellevue’s newest elementary school and opened in August 2009. Bellevue Elementary School was approved for construction in 2007. 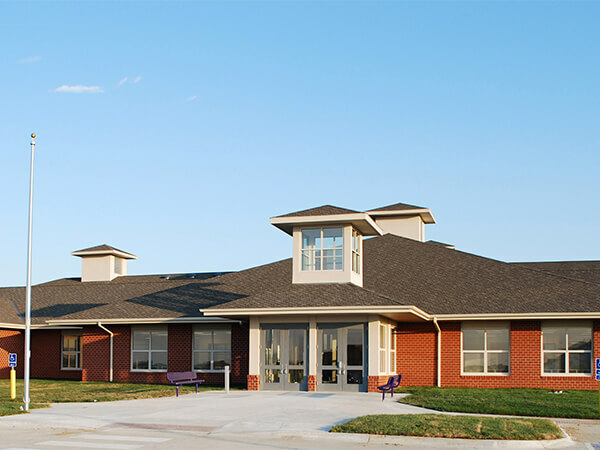 The school highlights the history of Nebraska’s first city, Bellevue, and includes a display on the history of the community and school district. This is the second Bellevue Elementary School. The first school opened in 1869 and was located on the Mission Reserve, land given to the city by the Omaha Tribe. The first Bellevue Elementary received many additions and eventually was named Mission Middle School. Their mascot was chosen as the red-tailed hawk to honor a Native American myth that the souls of these birds are involved in making the world a better place. School Purpose: To provide an academically challenging school for every learner. Our students will leave Bellevue Elementary with integrity, the ability to work with others collaboratively, and with the understanding that learning is a continuous process.